Root canals are necessary when the pulp layer of a tooth becomes infected, which is often a result of extensive tooth decay. Infection can lead to the loss of a tooth, so it is necessary to remove the infection with root canal therapy. The procedure is performed by a doctor for root canals under local anesthesia and is generally comfortable, saves the natural tooth, prevents the spread of infection, and helps return the smile to complete health. Before the procedure begins, the area is completely numbed using a local anesthetic. Once the area is numbed, a rubber dam is placed around the infected tooth to protect the mouth and to prevent anything from falling into the back of the throat. 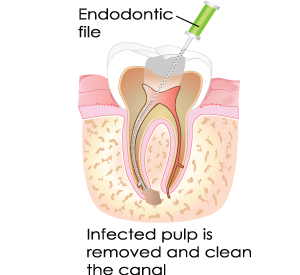 In order to access the infected tooth pulp, your doctor for root canals makes an opening through the top of the tooth to get down into the pulp chamber. A tiny instrument, called a dental file, is then carefully used to clean out the infected tissue and to shape the root canals to receive the filling material. 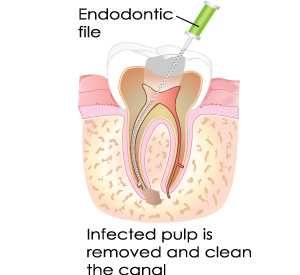 X-rays will be taken to ensure that all of the infected pulp is removed before the filling is placed and to confirm that the filling material reaches the ends of the canals in each root. After the infected pulp is removed, the restoration is placed. In most cases, a crown is placed to protect and strengthen the tooth. However, if the tooth is severely broken down, it may be necessary to start by building up the tooth with a post and core. 1. How did my tooth become infected? There are two common causes of infection: tooth decay and fractured or broken teeth. Both expose the pulp area to bacteria that live in the saliva. These bacteria can cause an infection that can kill the pulp. 2. Do I really need treatment? Symptoms tend to vary from patient to patient. Infected teeth may be sensitive to hot, cold or biting pressure, the area may be swollen or painful, or there may be a bad taste in the mouth. Occasionally, there will be no symptoms at all. 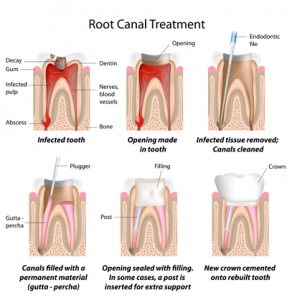 If you have tooth decay that is left untreated, it could necessitate the need for a root canal. Call your doctor for root canals to schedule your appointment as soon as possible.